Kuala Lumpur’s iconic Petronas Towers are among the world’s most impressive skyscrapers. Especially at night, these futuristic twin towers are so awe-inspiring that they make most other skyscrapers around the world seem a little bit inadequate. 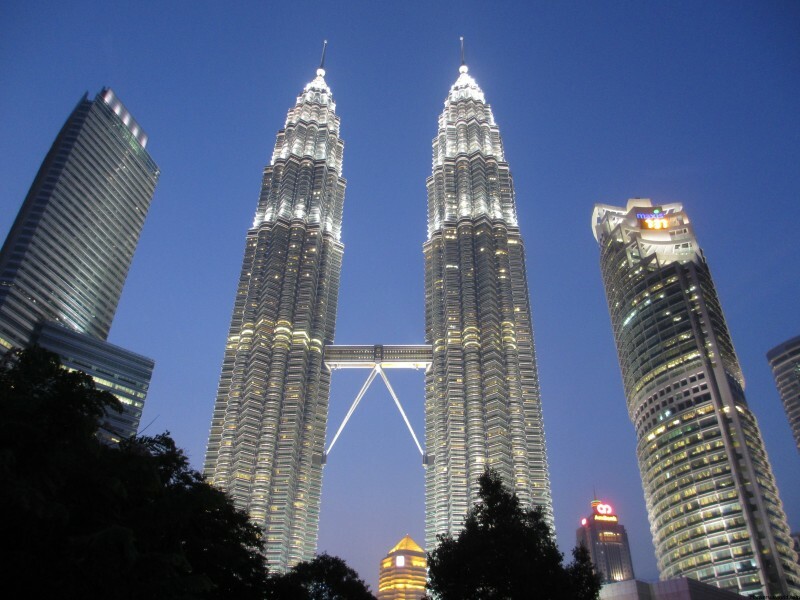 Planning work on the Petronas Towers began on 1 April 1994 with a strict Malaysian Government-imposed deadline of six years to complete the project. That’s a quick turnaround by anyone’s standards. To get it finished on time, two different construction consortiums were hired – one for each tower, and each floor had to be constructed in around four days. Construction of the Petronas Towers was finished in 1998, and they were officially opened on the Malaysian National Day, 28 August 1999. The total cost to build the Petronas Towers was around $1.6bn US. At 170m (558 feet), the double-decker skybridge that links the Petronas Towers on the 41st and 42nd floors is the highest two-story bridge in the world. As well as giving tourists an awesome view over Kuala Lumpur, the bridge will potentially act as a means of escape should disaster ever strike one of the towers. During the construction of the Petronas Towers it took three days and two attempts to lift the skybridge to its present location. On the first attempt, the crane that lifted it was short-circuited by a passing thunderstorm, so the bridge was left hanging in the air until the crane could be fixed. 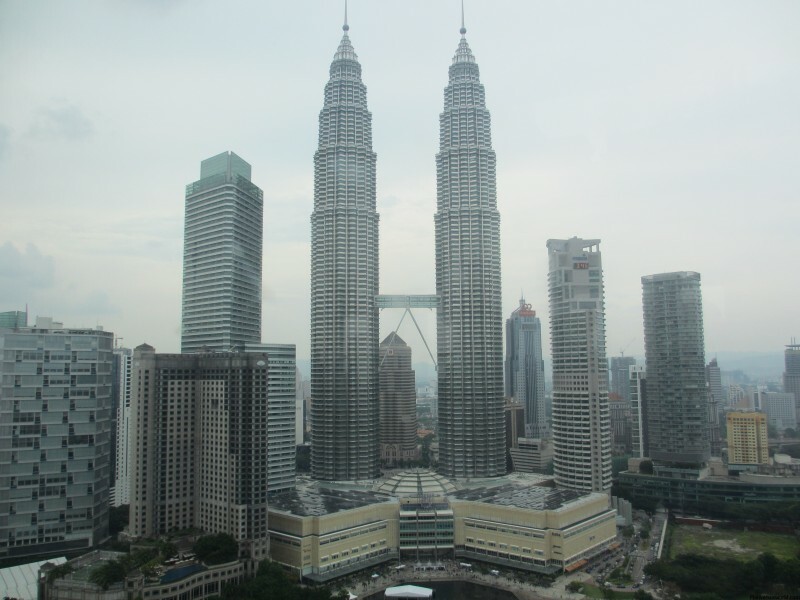 Argentine-American architect Cesar Pelli chose a postmodern design to create a 21st-century icon for Kuala Lumpur. Meanwhile, the glass façade was designed to resemble Islamic motifs, reflecting Malaysian culture. At 452m (1482.94 feet) each, the Petronas Towers were the tallest buildings in the world from 1998 until 2004, when they were surpassed by Taipei 101 in Taiwan. Since then, the Burj Khalifa in Dubai has become the tallest building in the world at 828m (2,717 feet) – but the proud Petronas Towers still have the distinction of being the tallest twin towers in the world. Missed the lift? There’ll be another one along shortly. Within each tower there are 10 double-decker lifts, which can carry up to 26 people per deck, or 52 in total. These lifts can reach speeds of up to 6.1m/second. Just writing about this makes me nervous: Austrian daredevil Felix Baumgartner set the world BASE jumping record in 1999 by jumping from a window cleaning crane near the top of one of the towers. Unfortunately for him, that record has since been broken. Speaking of crazy people who go way beyond what a regular person would deem ‘acceptable’ to get their kicks, French urban climber Alain “Spiderman” Robert climbed to the top of one of the towers in 2009 using only his bare hands and no safety equipment. It took him just under two hours. This is a scary one: thousands of people were evacuated from the Petronas Towers on 12 September 2001 – one day after the September 11 attacks in the US – because someone phoned in a bomb threat. Fortunately, no bombs were found. The Petronas Towers got the name because the main occupant of the building is PETRONAS (Petroliam Nasional Berhad), a major Malaysian oil and gas company. Although you may not have heard of it – I hadn’t – the company is certifiably huge, having been ranked in the top 100 of the Fortune Global 500’s largest corporations in the world index. At the time of writing, the Petronas Towers are open to tourists who’d like a tour of the skybridge and up to the observation deck on the 86th floor. 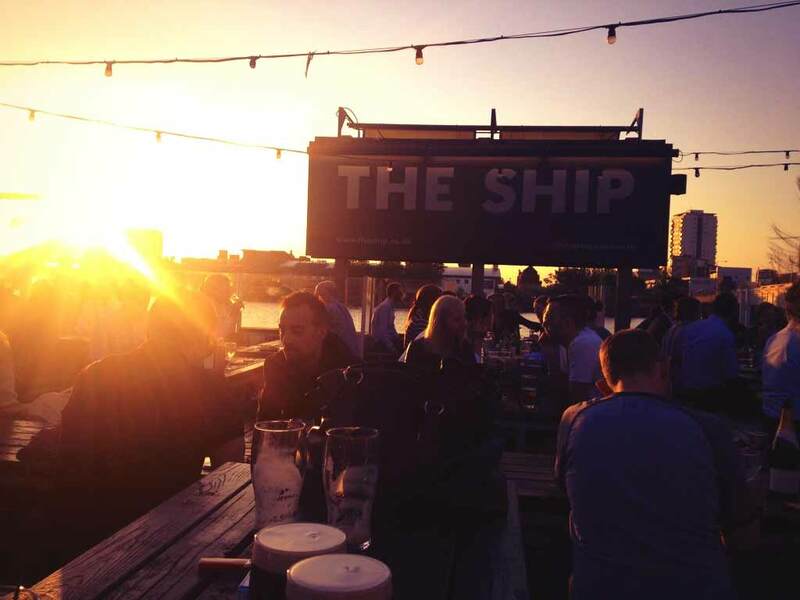 It’s open from 9am-9pm, Tuesday to Sunday. You can get tickets at the ticketing counter at the concourse level below the towers, which cost RM84.80 ($23 US/£15.50) for international adults and RM31.80 ($8.50 US/£5.80) for kids. They only release so many tickets per day, so get there early to guarantee your entry to the Petronas Towers. Personally, I recommend you visit the SkyBar in Kuala Lumpur instead of going up the Petronas Towers – or, even better, do both! From this awesome bar on the 33rd floor of the Traders Hotel you can enjoy the best view of the Petronas Towers while you enjoy a beverage or two.